by Mike Lawrence and Anders Wirgren. Two players from the USA and SWEDEN met on the Internet and went from playing a bit of bridge to writing about it. It took a long time for two sides of the ocean to finalize this book but it has been done and I have it. If 4H turned out to be a good bid, everyone nodded in agreement because they knew that the LAW had said bidding 4H was a good thing. If 4H turned out to be down 800 against 2S, everyone agreed that it was a statistical aberration. A sad moment. Eyes might roll a bit in wonderment that the LAW could be so off base. If you are trying to follow the LAW, you might be disappointed to learn facts such as this one. If there are sixteen total trumps between your side and their side, there will be sixteen tricks way less than you would like. It is not 100% of the time, it is not 75% of the time, it is not 50% of the time, it is 43% of the time. Do you want to make competitive bids based on something that is wrong more often than not? I Fought The Law of Total Tricks shows why having a ten card fit is not always a good reason for bidding at the four level. The number of trumps around the table is just not that big a deal. So what is important, if not trumps? No one will ever say that trumps are not important but they are just part of the recipe. Pasta, for instance, is not something you would like to be served exclusively, but it is an important ingredient in lasagna. As is the other stuff that makes it a popular dish. Now that I Fought The Law of Total Tricks is out, you can find for yourself the qualities that make hands good or bad. If, after reading the book, you would like to weigh in on this issue, you can go to a new web site. Read what others have to say about the LAW. 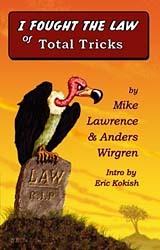 Anders Wirgren has set up a web site that will further the thoughts in I Fought The Law of Total Tricks. Details on this can be found in the book.